All foreigners (except citizens of some former Soviet republics) visiting Russia need a visa. 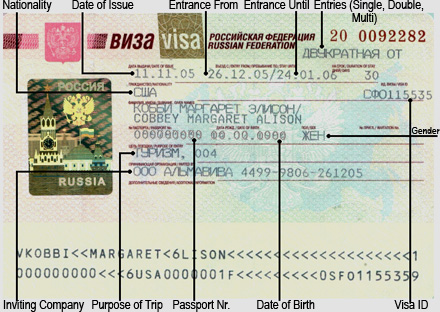 In order to get one, travelers need an invitation from a Russian citizen or a company, which is then taken to a Russian embassy or consulate, where the actual visa is issued. Within three business days of arrival in Russia, the visa needs to be registered by the person/organization that issued the invitation. If you don't make it through this bureaucratic loop, you may have problems leaving the country. Lastly, for those staying in Moscow or St. Petersburg, our office locations will offer registration on the spot. Prices for processing Russian visas vary according to the applicant's citizenship and the embassy/consulate applied to. Perhaps in response to the trials the U.S. Embassy in Moscow puts Russian visa applicants through, U.S. citizens routinely pay more for Russian visas. Tourist visas are best for short visits. In theory you to have a hotel and an itinerary planned for each night of your stay in order to get a tourist visa, but this rule is broken more often than it's followed. Many agencies can get you a visa and have it registered without a night booked in a hotel. All Go To Russia! Travel clients are provided Russian visa invitation with visa processing and do not have to worry about obtaining it separately. Business visas aren't just for foreigners working in Russia. Far more flexible than tourist visas, they are often the best choice for tourists who are visiting friends and don't need a hotel, or who are looking to spend an extended period of time in Russia, especially those who want to travel independently or extensively. In order to get a business visa you need an invitation from a Russian firm, which can usually be arranged through a qualified visa agency. You do not need to plan hotel reservations or an itinerary to get a business visa. Ask Go To Russia! Travel visa consultant for information or visit Russian visa page at www.gotorussia.com for complete details. Homestay visas are your best bet when you have friends or relatives in Russia who plan to host you during your trip there. Homestay visas are issued for up to 3 months, and, therefore, are more flexible then regular tourist visas. What’s not very flexible about them though is the invitation your Russian hosts will have to get for you – it takes sometimes up to 2 months for local UVIR’s to process their request and then an original has to be sent to the Russian consulate abroad for processing. 1. Always keep your passport with your visa on you while in Russia. 2. Make two sets of copies of your passport, visa and other travel papers and keep them separately – one in your luggage and another in your office or with your family and friends. 3.When planning to stay in Russia for over 90 days make sure to obtain an HIV test certificate. You may be asked to display it to medical officer at a Russian border checkpoint. Such certificate is not necessary when traveling for a lesser period of time. 4. When traveling with your pet, you’re required to obtain an international health certificate from a local certified veterinary doctor. 5. It is advisable to have medical insurance coverage valid in Russia. Check your medical plan and request such coverage if you do not have it. On the basis of reciprocity, citizens of Estonia, Israel, Finland, Austria, Belgium, France, Germany, Greece, Italy, Luxembourg, Netherlands, Portugal and Spain are required to have mandatory medical insurance. 6. Medical drugs can be brought to Russia in quantities sufficient for personal consumption during your stay. 7. Military-type firearms, narcotic drugs, explosives, radioactive, poisonous and other dangerous substances are prohibited to import to Russia. 8. Travelers carrying sport-guns or shotguns in their luggage must receive special permits through their Russian agents to take them in and out of the country. 9. Foreign travelers can bring to Russia their photo and video cameras, binoculars, laptop computers, etc. tax free if these are to be taken out of the country upon departure. Just mention them in your customs declaration or ask a customs officer. 10. Travelers over 16 years of age can take to Russia tobacco products (1000 cigarettes or equivalent), wines & liquors (2 liters) tax free. 11. There is no limitation on the amount of foreign currency to be taken to Russia. Just mention in your customs declaration all your currency over $500 and other valuables, including objects of art, which you take into the country. Keep declaration to present it to a customs officer upon departure. 12. If you are traveling on a double or multiple entry visas, prepare a copy of your visa before departure from Russia – a copy of your visa will be asked of you by the passport control officer. 13. Your Russian visa must be registered in the first 3 calendar days after your arrival to Russia. If staying at a hotel, your hotel will register your visa, if staying with friends or relatives – our Russian offices will be happy to assist with your visa registration on the spot. Please check with us for details or read our welcome letter. 14. Prior to your departure for the airport to fly to Russia, please, check your passport, visa and other papers again. If you have any questions, do not hesitate to call us. When calling, have last name of the travelers and their birth dates ready. 15. The Consulate of Russian Federation and our agency cannot be held responsible for any errors in visas not brought to our attention before your departure for Russia. Although it is possible to arrange your own Russian visa, most travelers choose to hire a visa service to do the work. Russian consulates have many options for visa processing, from a regular 2-week (cheapest) processing, to a very fast (and terribly expensive) same-day processing. If you live in a city with a Russian consulate, you may save some money by going and applying on your own. Beware, that most Russian consulates only accept paperwork early in the morning. But if you want to make sure you get your visa on time and without losing any sleep over it, hiring an experienced visa-expediting agency is the way to go. Since Russian visa also involves getting a Russian invitation, you want to deal only with those agencies that can assist you in both. Invitations can cost anything up to and beyond $500, depending on the type and the speed of service. For an extra $30-$70, agencies will offer full processing (invitation, taking visa to a consulate and sending it back to you). The best services will take care of registering the visa when you arrive in Russia. Given that each Russian consulate and embassy has different tastes and temperaments, it's usually best to have somebody who knows the ropes do the dirty work. One way to find reliable visa agencies is through Russian embassies and consulates. Unfortunately, only a handful of them are online. Russian Embassy in the U.S. Need to Travel to Russia in Business? Do you Need a Business visa to Russia? Get Business Visa invitation from Russian Visa Consulate with Go to Russia online service. Russian Business Visas are intended for foreign citizens who have business trip to Russia to visit different exhibitions or meer business partners and sing some contacts.